KSBA Launches New “Buy Local” Page! 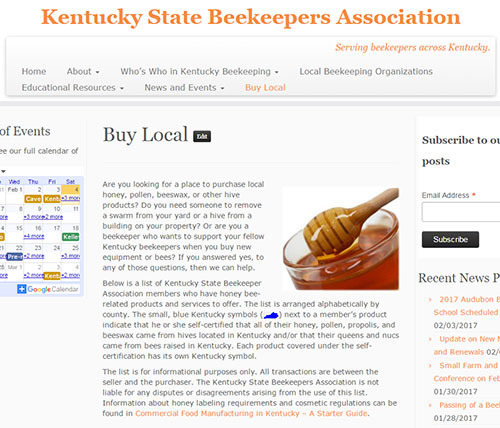 Members of the Kentucky State Beekeepers Association (KSBA) can now advertise their honey bee related products and services on KSBA’s new Buy Local page. Products and services listed on the site include honey, pollen, propolis, nucs, queens, lotions / creams, lip balms, candles, beeswax, beekeeping equipment, honey bee related art, plants for honey bees, swarm removal, and hive removal from trees or buildings. Where appropriate, members can self-certify that their honey, pollen, propolis, and beeswax are from hives located in Kentucky and / or that their nucs and queens come from bees raised in Kentucky. The goal of the page is to help the public, beekeepers, and others easily find Kentucky beekeepers who have products for sale or services to offer. To have your products or services featured on KSBA’s Buy Local page, join KSBA and fill out the second page of the membership form. If you have questions about the Buy Local page, please contact Shannon Trimboli, KSBA webmaster.